Growing Rhubarb is a permanent situation (perennial). 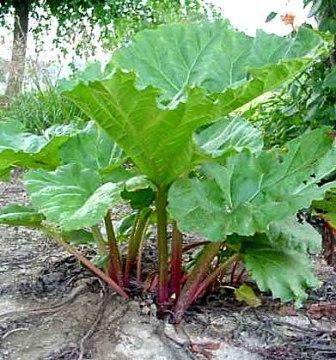 A cool season perennial, Rhubarb is very winter hardy. Rhubarb grows from crowns of rhizomes and buds. Following a season of growth the Rhubarb crown becomes dormant during winter. Bud development requires temperatures below 40°F. Rhubarb shoots that appear in spring are edible. These emerge sequentially as long as temperatures remain below 90°F. Top growth is suppressed as temperatures increase and appearing dormant in periods of high heat. While Rhubarb leaves do contain poisonous materials, they can be used in the compost pile. Once planted, Rhubarb plantings remain productive for 8 to 15 years. Caution: The leaves of rhubarb contain oxalic acid and soluble oxalates. Eating Rhubarb leaves can cause nausea, vomiting, abdominal pains, and even death. The concern expressed by some individuals is that the oxalic acid and soluble oxalates would move from the leaves to the stalks upon exposure to freezing temperatures. In fact, however, the movement of these compounds into the stalks is not a problem. Diseases: Botrytis Blight, Oedema, Powdery Mildew. 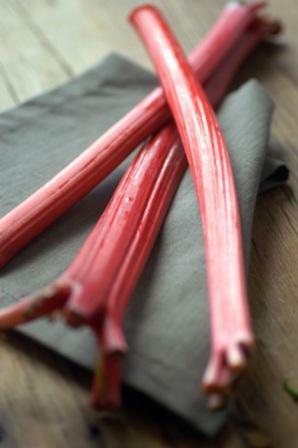 More Information on growing healthy rhubarb from Savor The Rhubarb. They also have amazing dishes using Rhubarb.